Despite these clear costs and benefits, restoration receives only a tiny fraction of the funding it needs. That’s where governments come in. 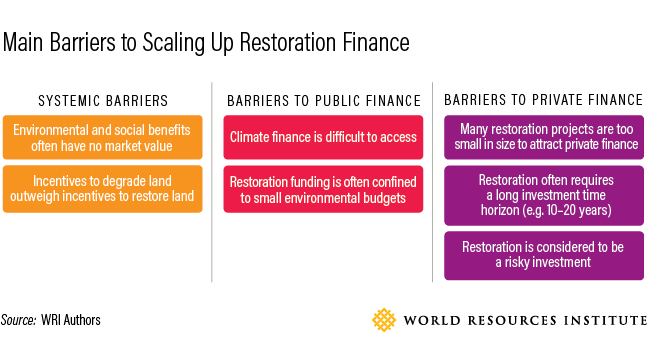 A new WRI report, Roots of Prosperity: The Economics and Finance of Restoring Land, looks at the barriers and opportunities to scale up finance in restoration. Monetizing environmental and social benefits: Carbon taxes are gaining momentum around the world. This is set to continue since 81 national climate plans, known as nationally determined contributions (NDCs), include some form of carbon pricing. Directing some of the revenues or proceeds from carbon pricing to climate solutions such as restoration will increase the impact of these prices in tackling climate change. Shifting incentives from land degradation toward restoration: In Costa Rica, for example, the government phased out cattle subsidies in 1991 and began financing restoration through a 3.5 percent tax on fossil fuels. This helped to increase national forest cover from 29 percent in 1991 to 54 percent in 2015 and supported the rise of eco-tourism, which now contributes 5.8 percent of national GDP. Supporting risk mitigating mechanisms to attract the private sector: Private investors consider restoration to be risky since it’s a novel area. Governments can spur private investment through risk mitigation mechanisms like loan guarantees or tax incentives. The Multilateral Investment Guarantee Agency, for example, issued guarantees of $27 million (2012) and $22 million (2015) to EcoPlanet Bamboo for its restoration investments in Nicaragua. Over a 15-year period, the protection will cover the company against the risks of expropriation, war and civil disturbance. Integrating restoration across many government ministries: In some countries, restoration is confined to environmental ministries and their budgets, which tend to be small. In Ethiopia, however, all relevant government agencies are involved in the national Climate Resilient Green Economy (CRGE) strategy, which includes restoration. The country has committed to restoring 15 million hectares of land by 2020 as part of the Bonn Challenge and has made the largest restoration commitmentto the AFR100 initiative, a country-led effort to bring 100 million hectares of land in Africa into restoration by 2030. 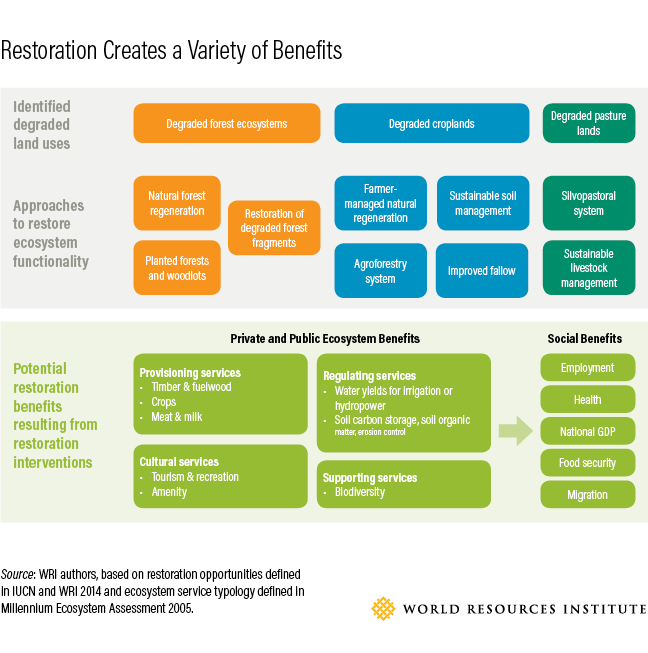 Quantifying the public benefits of restoration: Robust economic analyses can bring visibility to restoration’s true financial benefits, such as food security, job creation and more. For example, spatial optimization analysis by WRI in Guatemala identified that it was best to start the restoration project by focusing on forest areas along a Pacific Coast river, since this would deliver the maximum benefits. Our report lays out economic valuation methods and the three steps to create a standardized valuation framework. With the Bonn Challenge aiming to restore 350 million hectares of degraded land by 2030, 39 countries have made restoration pledges and more governments are making commitments every year. With the right economic policies and financial mechanisms in place, they can raise the capital needed to turn these pledges into prosperity.